Northern Tablelands MP Adam Marshall announcing that the former Armidale Courthouse would not be sold and erecting the ‘Not For Sale’ sign on the courthouse. 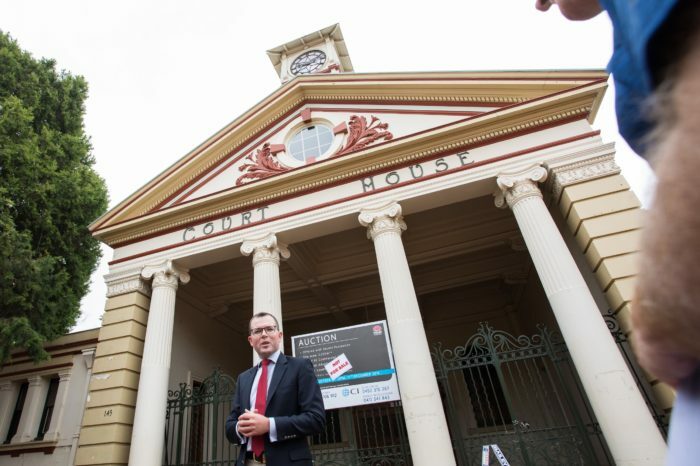 THE Armidale community’s push to keep the 158-year-old former Armidale Courthouse in public hands took a giant leap forward today, with Northern Tablelands MP Adam Marshall announcing the public auction of the iconic property, slated for later this month, had been cancelled. “This is a massive win for the local community and I thank everyone for their strong support,” an elated Mr Marshall said today. Last week, when Mr Marshall and the community discovered that, almost five years after the old Courthouse was vacated, Properties NSW had listed the buildings and land for public auction on 17 December, the MP immediately lodged an urgent request for the auction to be stopped. “I believed it was utterly inappropriate to try to auction this historic and iconic public building, particularly when there is an application for State Heritage listing currently before and being assessed by the NSW Heritage Council,” he said. Mr Marshall said he was delighted to receive news yesterday afternoon that Finance Minister Victor Dominello and Attorney General Mark Speakman had agreed to his request on behalf of the community to have the property withdrawn from market. “I thank both Ministers for siding with me and the community and overruling the departmental bureaucrats,” Mr Marshall said. “There is now an indefinite pause on the public auction of the Courthouse until the issue of the state heritage listing is determined. “In the almost five years since it was vacated, there have been claims for the property made under State and Commonwealth legislation – all refused and not appealed – and a protracted process to annexe the public toilet and bus stop adjacent to the courthouse, which was constructed on the property. “Now is the time for the oldest public building in Armidale, first constructed in 1860, to be properly recognised with NSW Heritage Listing and then transferred to council on behalf of the community for a peppercorn rate. Mr Marshall said he formally contacted Heritage Minister Gabrielle Upton late yesterday, requesting that the assessment of the application for State heritage listing of the Courthouse building be fast-tracked. “Together we have won this fight and I will keep the community informed about the progress of the heritage listing application,” he said.